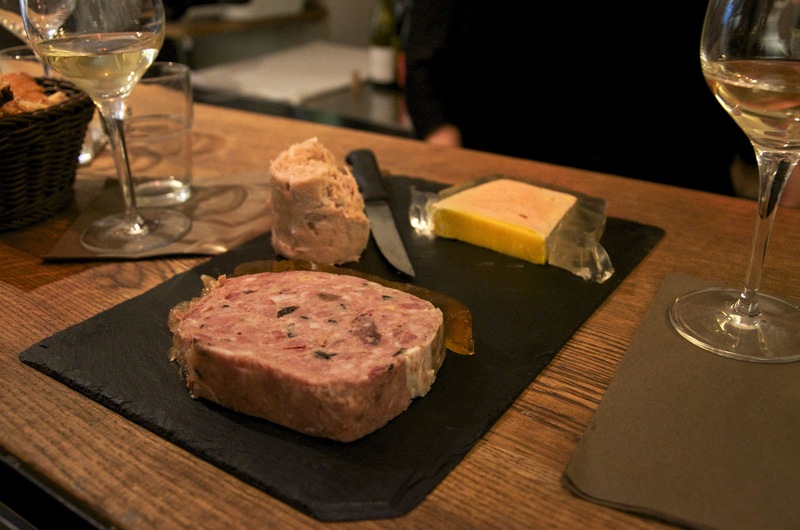 The first week of October I was lucky enough to be taken on a private food walking tour of Paris by none other than Meg Zimbeck, the founder of the most popular Parisian food blog of the moment, Paris By Mouth. We started at Eric Kayser on Rue de Bac, a baker that Meg believes makes one of the best baguettes in Paris. Always look for the sign "boulanger," which means the bread is baked in-house. At Kayser, ask for the baguette monge, which is made with a living levain, or yeast, that results in a better baguette. Did you know that the French government mandates that traditional baguettes not be sold for more than €0.90 so that they can be accessible to everyone? 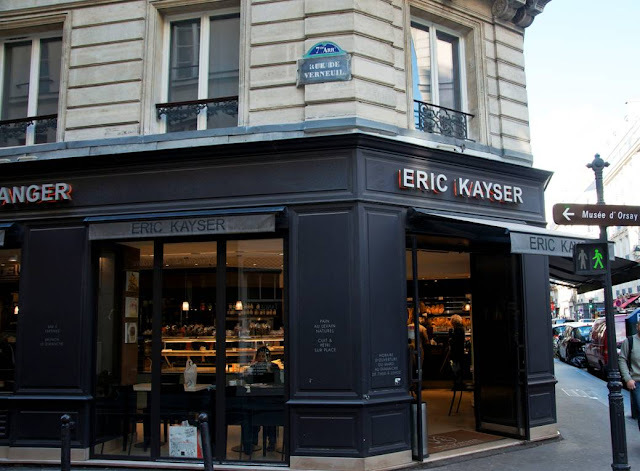 If you can't make it to Paris, I hear Eric Kayser are opening in New York City soon. What's a baguette without cheese?! 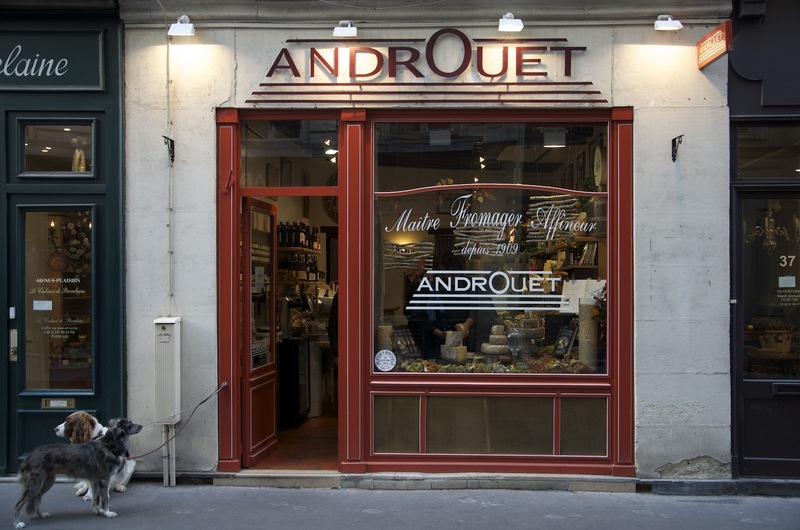 Our second stop was Androuet on Rue de Verneuil. 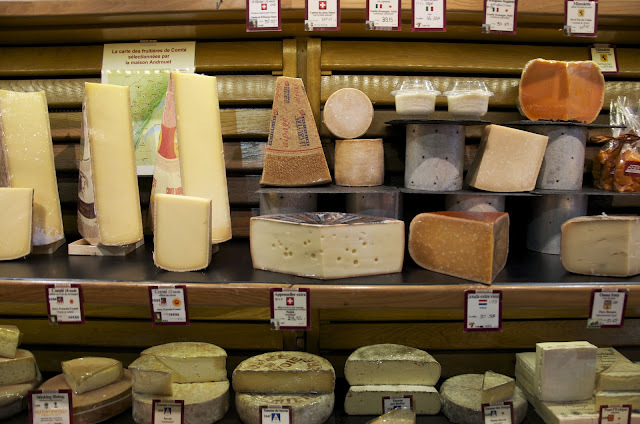 Androuet are not only sellers of cheese, but are "affineurs," which means they age the cheese themselves and are much more knowledgeable because they are responsible for the entire lifespan of the cheese and its maturing process. In business in the same location since 1909, many believe this is where Julia Child would have bought her cheese, as her house was not far away. We ended up buying twelve (!) 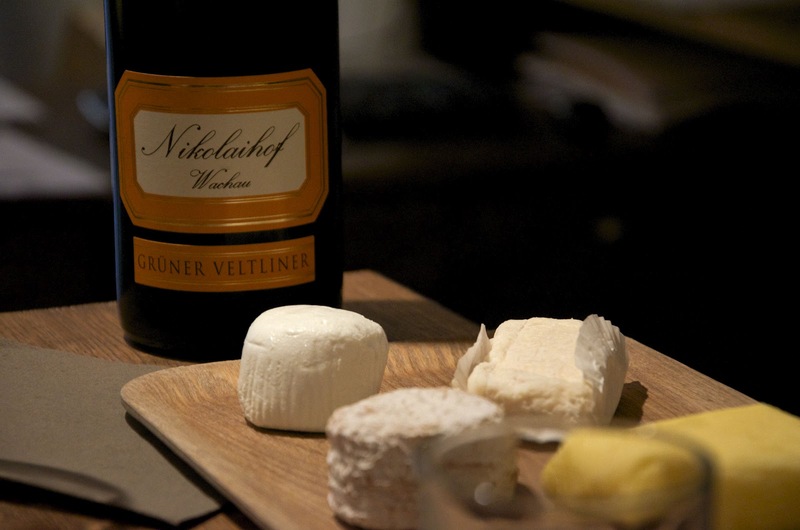 cheeses and this is our selection taking shape. At the end of this post I will describe each individual cheese we purchased. A food tour wouldn't be complete without something sweet, so we headed to Henri Le Roux on rue de Bourbon le Château for their famous salted butter caramels and chocolates mixed with the most interesting ingredients like pink peppercorn, buckwheat ganache and thyme, to name a few. 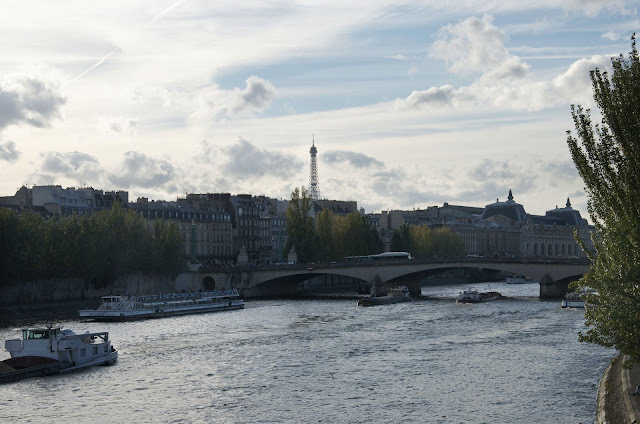 From there we walked over the Seine River on the Pont des Arts with its famous locks and distant view of the Eiffel Tower. Many lovers attach padlocks to the railing or the grate on the side of the bridge, then throw the key into the river below, as a romantic gesture. The City of Paris has not yet adopted a definitive policy on how to deal with this new fad, but its lovely to see them glinting in the sun. The last stop of the food tour was a special one: Meg had arranged for the five of us to bring all of the goodies we bought to a wine shop called Spring (related to the restaurant of the same name) for a private wine tasting. For those of you who don't follow the Parisian restaurant scene, Spring is the hottest restaurant in Paris right now, and headed up by a chef from New York City. I hear getting a reservation is an impossibility. 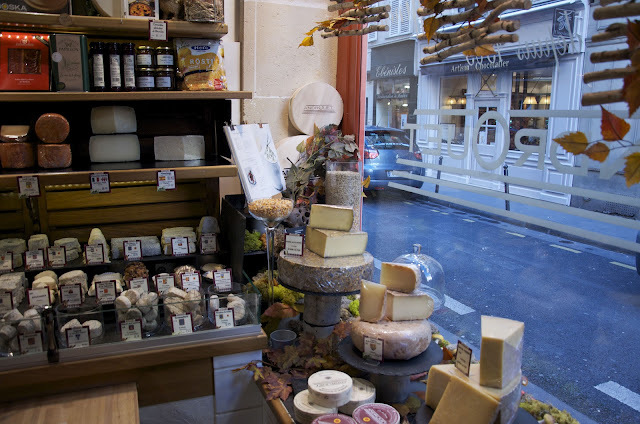 We had baguettes and fig bread from Eric Kayser, 12 cheeses from Androuet, some foie gras and force meat from Maison Guyard and chocolates from Henri Le Roux, each accompanied by a special wine. Meg guided us through each cheese ... she has an amazing encyclopaedic knowledge of all things related to cheese, it really is astounding! Mercedes, the birthday girl, got a different sort of "cake" this year ... it was a stinky cheese with a candle! Here is a list of all of the wines that we tasted throughout the evening. For those interested, Spring runs a wine club that you can subscribe to and they will send you wines each month that are not available in the United States. 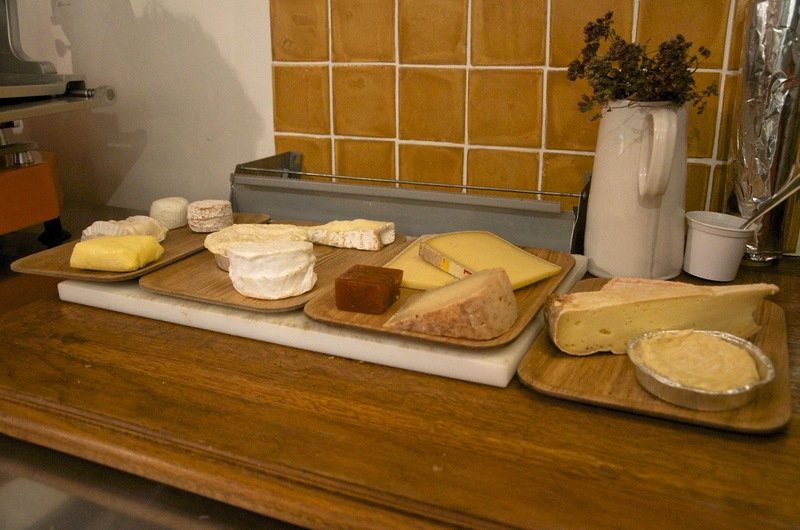 I think I've overdosed on cheese for the rest of the year, but next time you are in Paris, contact Meg to make all your culinary dreams come true! This place is probably one of the best choices for those who want to repair the glass of Reparation iphone. Cheap price and good skill were good for me. During repairing Captain-repair, I was waiting in the Captain-repair shop in comfortable, he didn't take long time to repair it Good place…..